Reboot Congress: #MOSen: Why Isn't Webster Design, Inc., Listed on Claire McCaskill's Financial Disclosure? 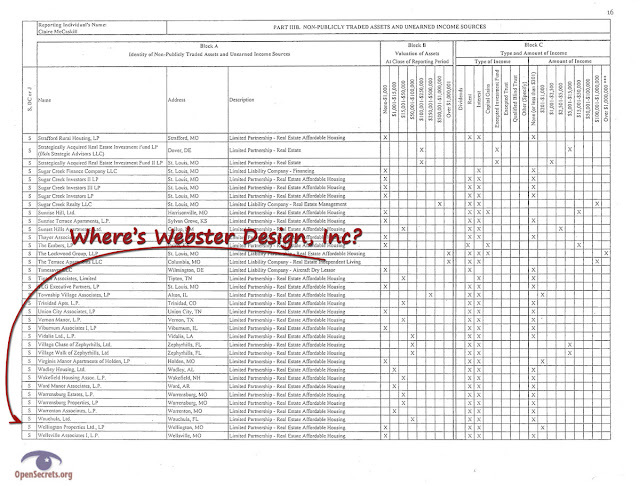 #MOSen: Why Isn't Webster Design, Inc., Listed on Claire McCaskill's Financial Disclosure? Note: I posted the Missouri Secretary of State documents for Webster Design, Inc., to Scribd because the links to them below were not working reliably. I've updated the links below to use the Scribd documents instead of the unreliable links to the Missouri SoS website. The image above is from page 16 of Claire McCaskill's most recent Personal Financial Disclosure which is available on OpenSecrets.org. 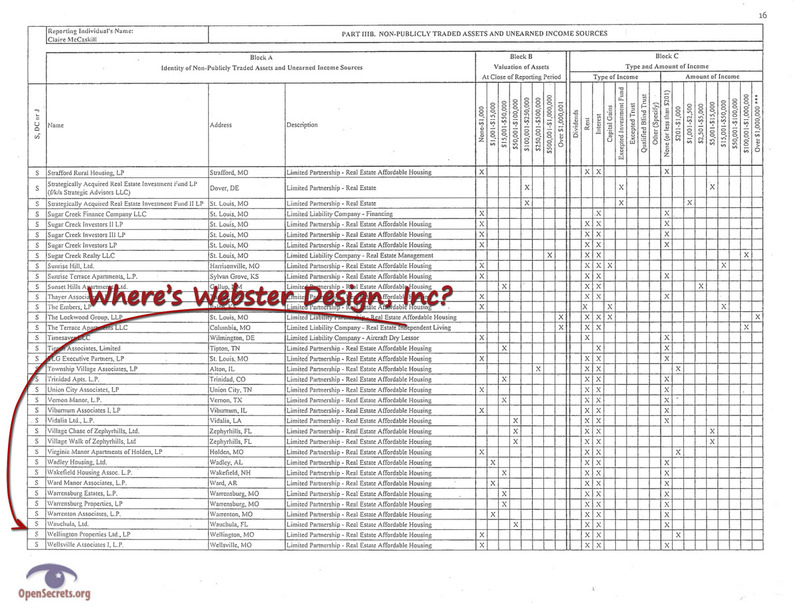 Webster Design, Inc., is not listed on McCaskill's disclosure. Nor could I find Webster Design on any of her prior year disclosure forms. If that's the case, then why isn't Webster Design, Inc. listed on Claire McCaskill's disclosure form? 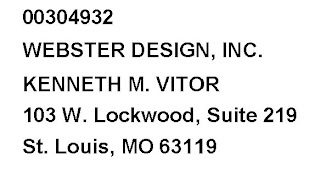 On 7/24/1987 Webster Design, Inc. was incorporated with a registered office at 17 W. Lockwood, St. Louis, MO. Mala Bridwell was the company's first registered agent and the three board members were Claire McCaskill's husband, Joseph Shepard, Ken Vitor, and William Obrock. On 6/29/1990 Joseph Shepard replaces Mala Bridwell as the company's registered agent. Mala resigned as registered agent from a number of companies in June of 1990. Her letter of resignation is available at the Missouri Secretary of State website and was submitted on the letterhead of The Lockwood Group. On 5/15/2000 the Webster Design, Inc. annual report reflects a change in the principal place of business to: 103 W. Lockwood, Suite 218. The mailing address of "Joseph Shepard; 17 W. Lockwood" is also on the report. On 4/13/2001 Webster Design's principal place of business has moved next door. It's now located at: 103 W. Lockwood, Suite 219. The registered agent for the company also changes in 2001 as Kenneth Vitor replaces Joseph Shepard. That registered agent change re-affirms 17 W. Lockwood as the "present registered office" of Webster Design, Inc.
On 4/23/2005 their annual report shows the addition of Bill Luchini to the board of directors. 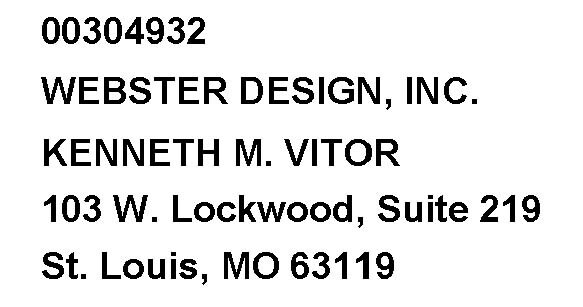 On 4/23/2007 the mailing address of Webster Design is now the same as the address of their principal place of business: 103 W. Lockwood, Suite 219. There was no change of address form reflecting this change on the Secretary of State's website, but I'm not sure if one was required. On 5/26/2009 Webster Design filed a "Statement of Correction" to amend their 2009 annual report. The correction added Damon Femmer of 103 W. Lockwood, Suite 218, as an officer of the company because they were required to add a licensed architect. Femmer had been with the company for a number of years, serving on its board and, at one point, as its president. Since the mailing and principal place of business are located next door in Suite 219, this implies that there's some collaboration between the people in those two suites. On 4/29/2010 the board of directors of Webster Design has been reduced to just one member: Bill Luchini. Vitor is still the registered agent. Femmer is Vice-President. I'll speculate that Luchini purchased a controlling stake in the company by this point. On 2/14/2012 Webster Design filed another "Statement of Correction". This one amends their 2011 annual report to add Damon Femmer as Vice President. On 4/2/2012 Webster Design moved from 103 W. Lockwood to 763 S. New Ballas Rd, Suite 300. They also changed their registered agent from Kenneth Vitor to Joanna W. Owen. Earlier this month, I asked: why Isn't Capstone Development Listed on Claire McCaskill's Financial Disclosure? Given Shepard's early and active involvement with Webster Design, Inc. as well as the fact that CorporationWiki.com has identified him as a shareholder, it stands to reason that he has an equity stake in Webster Design, Inc. Why isn't Webster Design, Inc. reported on Claire McCaskill's financial disclosure forms?